The Holiday Blizzard of 2006 highlighted the need for winter travel preparation. ThorntonWeather.com presents the first in a series from the National Weather Service (NWS) on Winter Weather Preparedness. Before hitting the road, Coloradoans need to ensure that they and their vehicles are prepared should inclement weather strike. Today’s message from the NWS and ThorntonWeather.com highlights the importance of having a proper emergency kit in your vehicle and should the worst-case scenario occur where you get stuck, what you should do to survive. Winter Weather Preparedness Week continues through Saturday, October 25 as proclaimed by Governor Bill Ritter. Before winter weather arrives in earnest it is highly recommended that you prepare your car or truck for winter travel. A well equipped vehicle has adequate tires, tire chains, tow rope, sand or cat litter for traction, shovel, tool kit, windshield scraper and brush, battery cables, first aid kit, flashlight, extra batteries, blankets and/or sleeping bags, extra clothing, candles, water-proof matches, high calorie packaged food for quick energy and an empty can to melt snow for drinking. The best way to prevent treacherous winter travel is to avoid it. This can be done by staying informed about the current weather and road conditions as well as the latest weather forecasts. 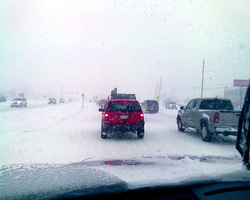 Information on road conditions in Colorado is available on the web at www.cotrip.org or by dialing toll free 1-877-315-7623. Road conditions for neighboring states can also be obtained on a link from www.cotrip.org. If you should become stranded during a winter storm stay with your vehicle and do not panic. If accompanied by others take turns sleeping. Run the motor every hour for about ten minutes to maintain warmth but keep windows open a little to prevent the buildup of carbon monoxide. Make sure the exhaust pipe is not blocked. Keep the car visible with brightly colored cloths tied to the side view mirrors, door handles or external antenna. Exercise periodically by vigorously moving arms, legs, toes and fingers. In the mountains avalanches become a possibility in the winter especially below steep slopes. Avalanches occasionally come down across roads with little or no warning. However, avalanche control work is performed on many avalanche prone roads in Colorado making the roads safer to travel. Caution is advised when traveling along avalanche prone roads, especially during and shortly after a heavy snowstorm or during periods of rapid snowmelt. Very strong downslope winds occur at times mainly along the Front Range of Colorado. These Chinook and Bora winds can have gusts exceeding 100 mph. Persons traveling in light weight or high profile vehicles should avoid travel during these strong wind events especially on north-south oriented roads. Roads which appear to be clear in the wintertime may actually be coated with a thin layer of ice commonly known as black ice. This nearly invisible ice layer can cause you to rapidly lose control of your vehicle. Black ice is most common during the nighttime hours. If you detect black ice you should reduce your speed. When braking on icy and snow-packed roads it is recommended that you apply steady pressure to the pedal just to the point of brake lock-up allowing plenty of extra stopping distance. For those without anti-lock brakes another suggestion is to gently tap on the brake pedal several times just prior to applying steady pressure. This entry was posted on Monday, October 20th, 2008 at 12:57pm MDT and is filed under Colorado Weather, Thornton Weather, Weather Education. You can follow any responses to this entry through the RSS 2.0 feed. You can skip to the end and leave a response. Pinging is currently not allowed.